60 mins Abhyanga full body oleation – – For Fatigue, Stress and Tension. Deeply relaxing and meditative with long lasting benefits. This is a gentle but firm Ayurvedic massage from head to toe, assisting circulation and relaxation. 30 mins Indian Head & Shoulder Massage – Immediate Stress Release – Uses warm herbal oil to treat the crown, forehead and throat chakras, as well as numerous pressure points, relaxing the mind and nervous system. 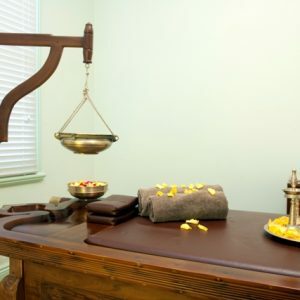 30 mins Sound Therapy – Ancient healing music called Gandharva is played whilst you relax and sip a delicious detoxing herbal tea, completing the transformative sensory experience.